You may have previously come across the advice that tomatoes shouldn’t be refrigerated, but should be stored at room temperature, in order to maximise their flavour. 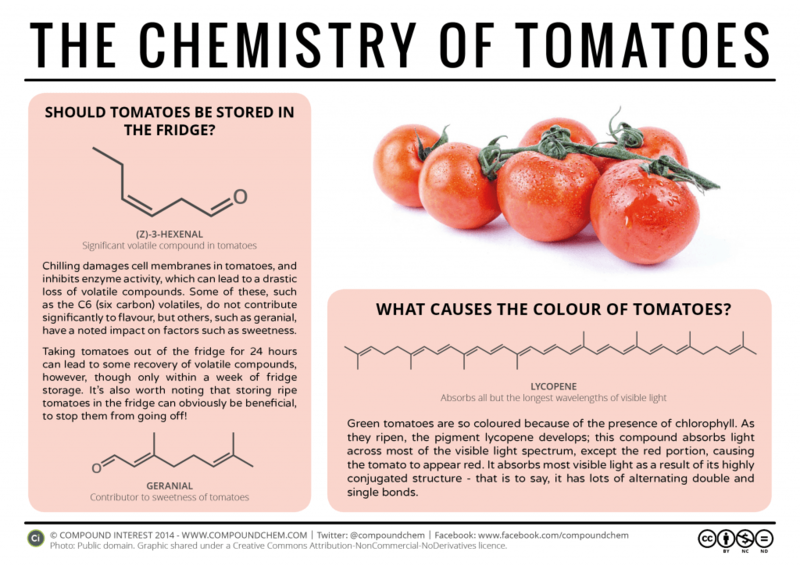 To understand the reasoning behind this, we need to take a look at the chemical compounds that give tomatoes their flavour, and the effect that refrigeration has on the production of these. Let’s first consider the compounds we’re talking about in the first place. Volatile compounds are those that easily evaporate at room temperature, and are responsible for the aromas, and to an extent flavours, of foods. For most foods, a complex mixture of compounds goes into producing the aroma and flavour, and tomatoes are no different. Over 400 volatile compounds have been detected in tomatoes, but of these, researchers have narrowed it down to around 16 key compounds that are associated with flavour and sweetness. The C6 volatiles (chemical compounds based on six carbons) are known to be the most abundant class of volatiles in tomatoes, but researchers have found that they are not likely to have a significant impact on the flavour of the tomato. With that said, it’s interesting to note that one of the most abundant tomato compounds in this class, (Z)-3-hexenal, is also the chemical compound largely responsible for the aroma of fresh-cut grass. The flavours in tomatoes owe a lot to the presence of sugars such as glucose & fructose, as well as fruit acids, but it’s the effect that chilling has on the volatile compounds that gives weight to the argument for not storing them in the fridge. A 2013 study found that tomatoes stored at 4˚C showed a drastic decrease in the concentrations of volatile compounds; after 30 days of storage at this temperature, they found that the overall concentration had decreased by 66%. They discovered that the low temperature storage was in particular detrimental to the aroma of the tomatoes, whilst, by contrast, storage at 20˚C resulted in an increase in volatile compound production. The lower volatile compound production at refrigeration temperatures is due to the inhibition of enzymatic activity in the tomato. In theory then, it seems an open and shut case – tomatoes & refrigeration just don’t get along. However, the study also points out that, for up to a week of storage in the fridge, removing the tomatoes from refrigeration for 24 hours could ‘recondition’ them and increase volatile compound production once again. This was still possible for periods of time longer than a week, but in these cases there remained a discrepancy in the levels of volatile compounds compared to tomatoes at room temperature. Obviously, the refrigeration of tomatoes is often for practical purposes, and it’s doubtless much more conducive to your tomatoes not beginning to rot away if they’re stored in the fridge. It is, however, particularly important not to store tomatoes that are yet to fully ripen in the fridge, as this can slow the ripening process. In short, the verdict seems to be that you can get away with storing fully ripe tomatoes in the fridge for up to a week to prevent them going off, before then leaving them out for a short time to recover their volatile compound producing ability. Leave them in for longer than a week, and you’re going to be enjoying a less flavoursome tomato!